Go with the popular power of bottled water with this 8 oz. Aquatek Bottled Spring Water. This promotional water bottle holds 8 oz. / 240 ml of fresh, 100% spring water. 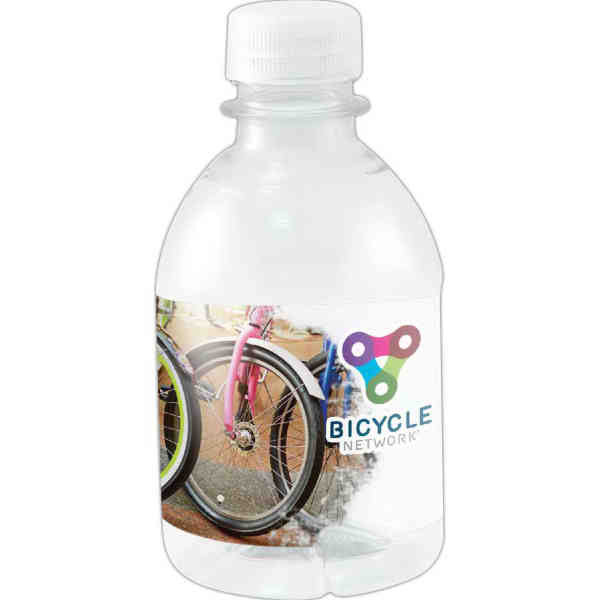 Your company message will be protected with waterproof labels wrapped around each bottle. Whether you want to offer it as an amenity in a hotel room, a thirst quencher at a fun run and beyond, this water bottle is truly built to please. Your order comes complete with a full color process imprint of your custom brand image. Please note that we cannot ship to Canada. Product size: 4.875"h x 2.5"w.
Price Includes:full color process decal. Ship Weight:30 lbs, Please note: Cannot ship to Canada.